Whether you’re the designated first-aid person at your office, training to be a nurse or there’s someone suffering from high blood pressure in your family, there are many reasons why might be looking for a home blood pressure kit. In fact, it is an essential part of every home medical kit that every family should have, just in case. While these were very expensive in the past, thankfully advances in the manufacturing of medical instruments has meant that there are very many affordable yet high quality manual blood pressure machines available, and we’ve compiled a list of the best ones you can find in 2019. What is in a Blood Pressure Kit? 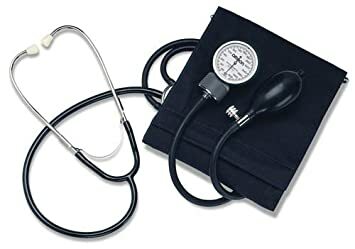 Sphygmomanometer – Also called a blood pressure cuff or blood pressure gauge, these instruments measure blood pressure the old fashioned way. The cuff is wrapped around the arm and then inflates, while a mercury gauge measures the pressure. They are simple to use and very reliable. Stethoscope – A stethoscope is used in conjunction with the Sphygmomanometer when taking the blood pressure reading. It is used on the brachial artery in the elbow to listen while the cuff is inflating. As the pressure in the cuffs falls, a “whooshing” or pounding sound is heard as the blood begins to flow again. The systolic blood pressure is the pressure when this sound begins. 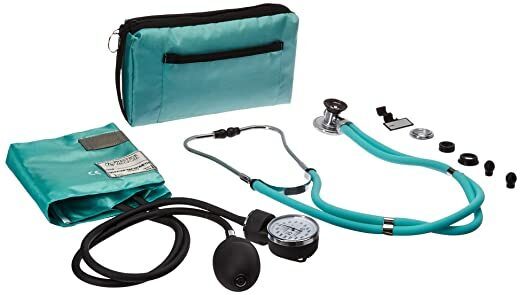 This simple yet highly effective kit comes with a blood pressure cuff and stethoscope, and it will be great for medical/nursing student or for those suffering from hypertension. It is also has accessories including contains 2 diaphragms, 2 pair of ear tips and 3 bells, and it comes in a handy zip-up pouch. If you’re looking for a simple, no thrills way to get accurate blood pressure readings, this is the kit for you. 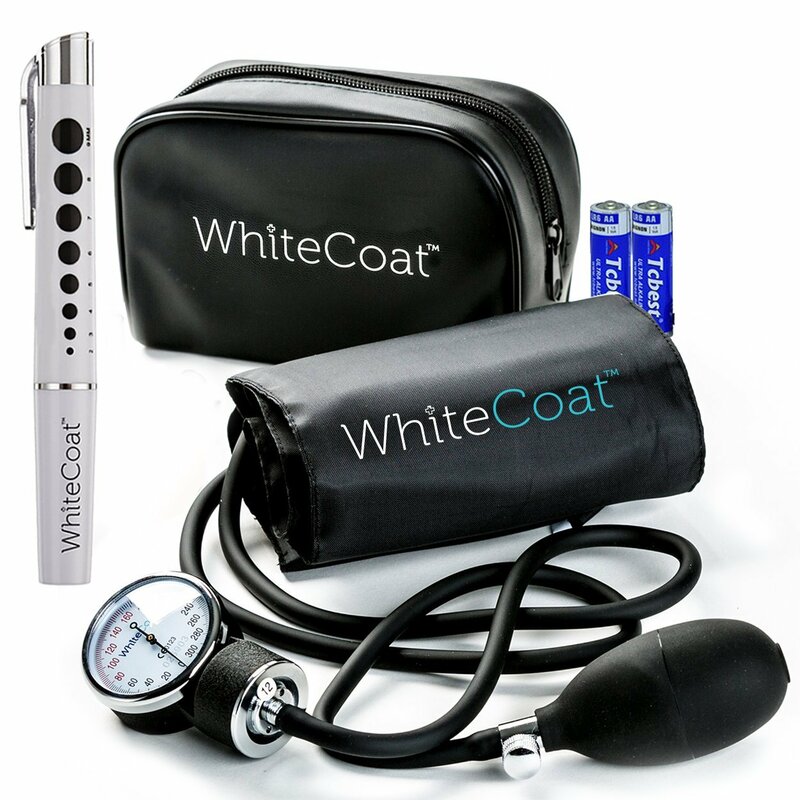 Take the stress out of daily blood pressure readings with this excellent manual blood pressure machine and stethoscope kit. This is a high-quality and very dependable set that is easy to use and guaranteed to give you accurate readings. 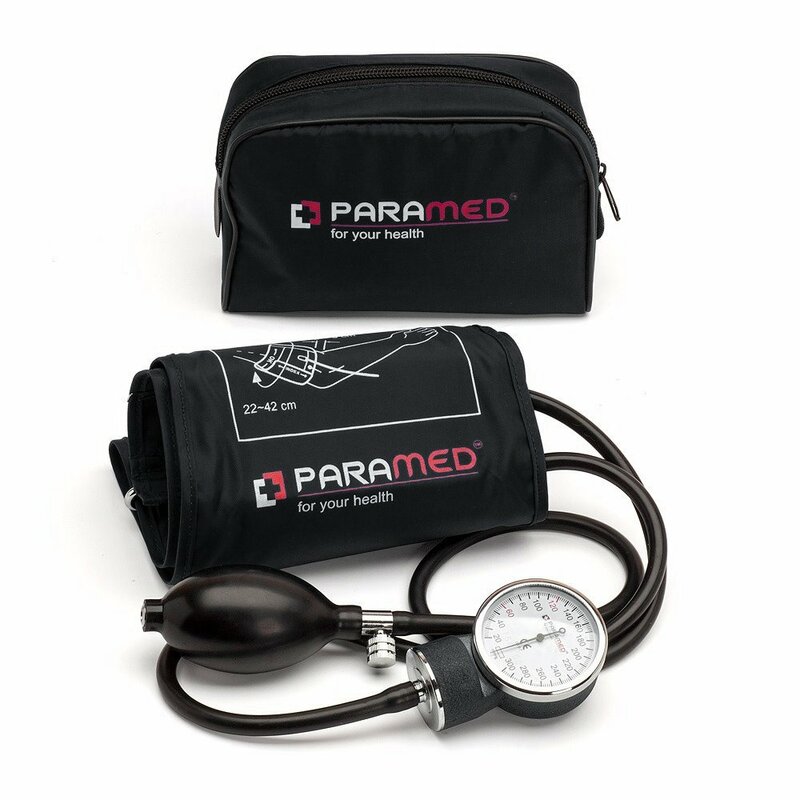 The manual BP cuff is equipped with pin stop movement, along with an extended universal pressure cuff, made of high quality pvc and polyester, which will give you clinical measurements. Everything is neatly packaged in a durable nylon case, making it easy to transport and store. Don’t be fooled by the cute purple colors here; this is definitely not a child’s toy. This kit has been clinical tested to give the results you need, and it has an accuracy of +/- 3mmHg. The cuff fits arm 10″ to 16″ in circumference, and a large, high-contrast dial for easily taking blood pressure readings. As such, this is the perfect kit for seniors or those with poor eyesight or issues reading. If you’re going to be in need of a cuff that can fit arms of all shapes and sizes, this is the kit for you. 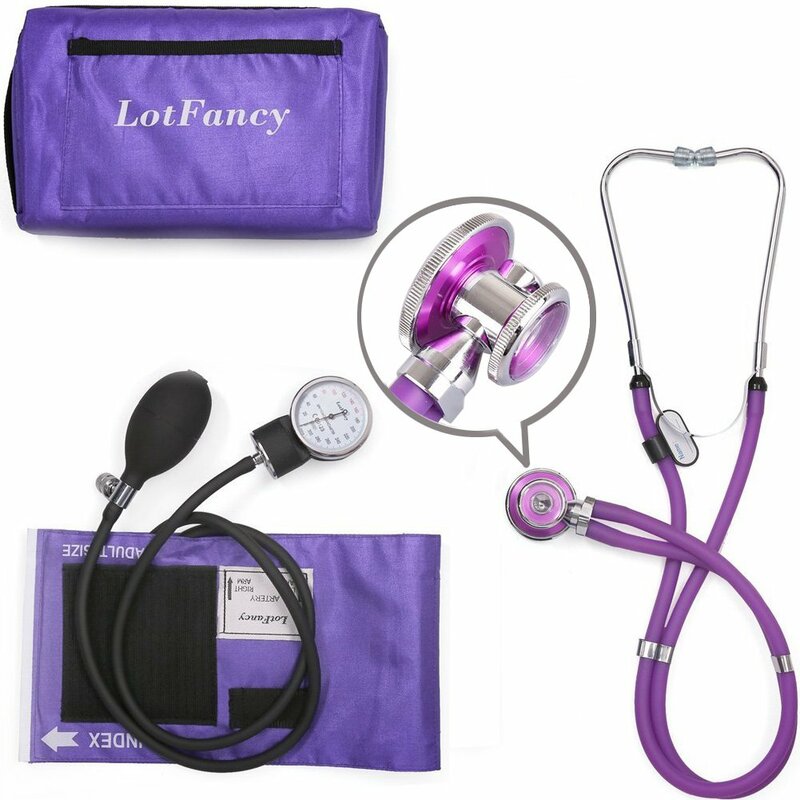 the sphygmomanometer set features 5 interchangeable cuff sizes, from Large Adult all the way down to Infant and even a very large on for a thigh reading, so no matter who’s pressure you need to take, this kit will let you do so with ease. It also comes with an LED penlight and a handy carrying case for good measure. This will be great for a family first aid kit or for a school nurse or first aider. 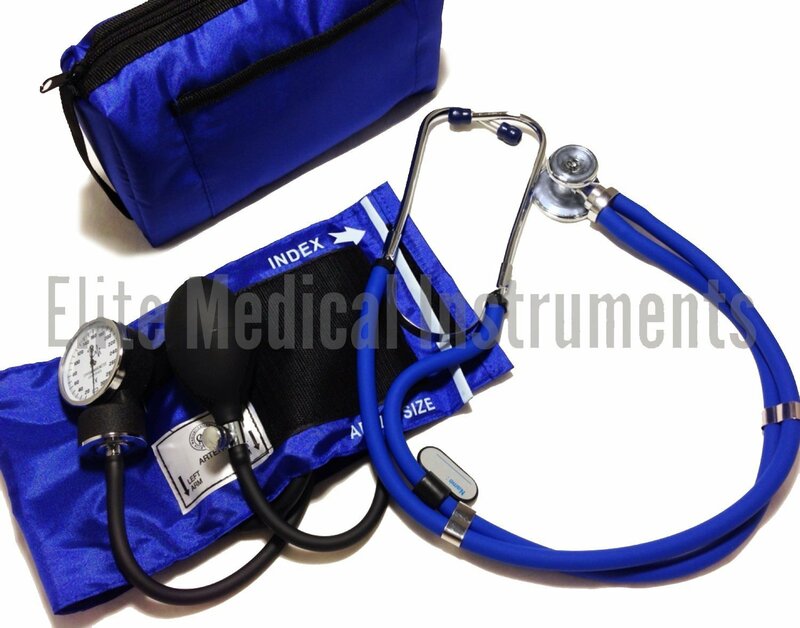 This aneroid sphygmomanometer / stethoscope combination kit comes with Prestige’s most popular aneroid sphygmomanometer matched with their best selling traditional Sprague-Rappaport stethoscope, making it a bit of a step up from most home blood pressure machines. If you are looking for a very professional and versatile kit, check out this one. 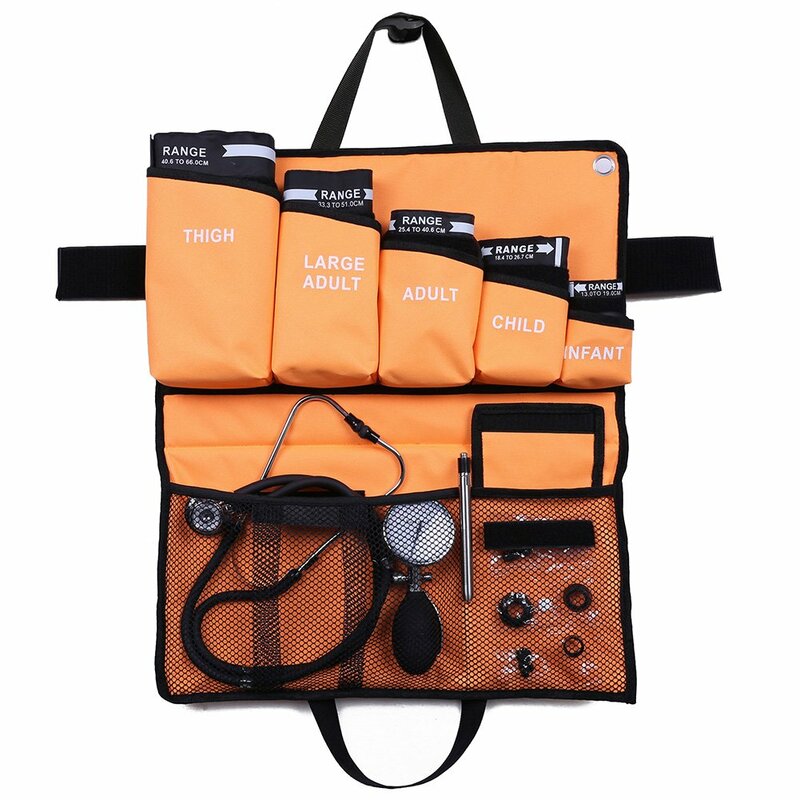 This small and compact kit is great for people who need a small sphygmomanometer on the go. it also has an LED pen light and batteries, in case you need to check the whites in peoples eyes. The only issue with this cool little kit is that it doesn’t come with a stethoscope. However, if you already have one and you are just looking to fill out your blood pressure machine with a BP cuff, this is is for you. 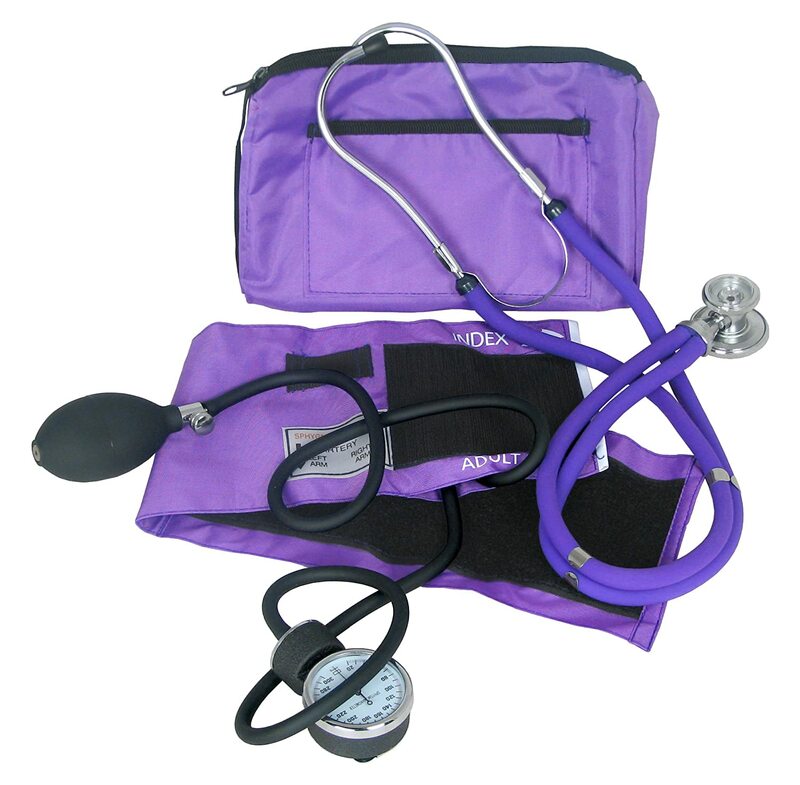 This high quality blood pressure set includes a a Sprague Rapapport Stethoscope and an Aneroid Sphygmomanometer nylon and a regular Regular Adult sized cuff. Both have markings, a gauge holder, artery indicator label, standard, precision gauge made to professional standards, and this has been designed for use by doctors, nurses and EMT workers, so you will be getting a high quality product for your home. Also, if you need to set it up for use with children, the adult and pediatric diaphragm assemblies can be removed and replaced with adult, pediatric, and infant bells, so you can get a lot of use out of this. It also comes in a handy carry sleeve, which makes it easy to store and to transport, should you need to. This will be good for home use, medical professionals and nursing students. 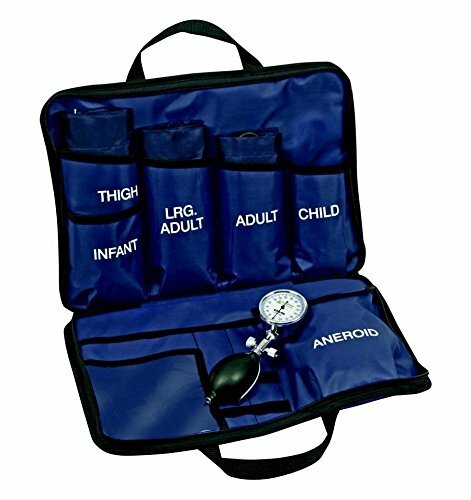 For those with large families or who have a lot of people they need to attend to, this kit will serve them well, as it comes with five different blood pressure cuffs that can be attached. There is one for adults, children, infants, large adults, and one for the thigh just in case an arm cannot be used. Its rugged nylon carrying case will keep all the instruments protected and safe, and also makes for a tidy storage solution too. The instruments themselves are chrome-plated, giving them durability, and they have been calibrated to give highly accurate readings. If you’re looking for a high quality cuff and you don’t need a stethoscope, this might be the one for you. It has a a long, universal cuff (22-42cm) constructed from extra durable, wear resistant nylon, as well as a high quality, comfortable Velcro strip that allows for easy measuring in any body type, from the slimmest to the biggest, so you don’t need to worry about attaching different cuffs. The Paramed manual blood pressure cuff ensures effortless and professional blood pressure reading at home, making it less of a chore. Just be aware that this does not include a stethoscope. If you are looking for a great kit and have the money to splash out, we recommend the 5 in 1 Blood Pressure Monitor kit simply for the fact that it has adjustable cuffs to suit almost every size of arm. Also, for those times when you can’t get a good reading from an arm, there is also the thigh cuff. So, this is probably the best kit for families, schools and offices. If you just need a kit for one adult, though, this might not be the most cost effective option for you. 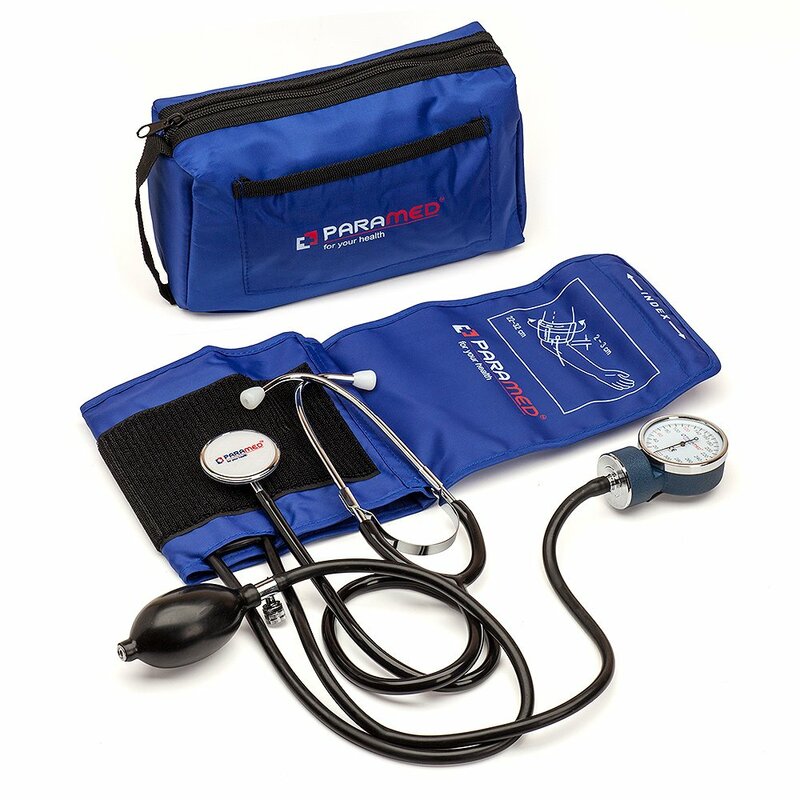 If you want a sphygmomanometer kit but are on a tight budget, the Paramed Manual Blood Pressure Cuff will do just fine. Despite being such an affordable set, this features very high-quality equipment that is sure to give you accurate and reliable readings. How do you Take Blood Pressure? Place the cuff around the upper arm and ask the patient to keep their arm at the level of their heart. Inflate the the cuff slowly and stop inflating when pulse disappears. As the cuff deflates, watch the mercury level in the sphygmomanometer. when the pulse reappears write down the the sphygmomanometer reading (the number the mercury has reached); this is the the systolic pressure. Let the cuff deflate until the pulse disappears: record this reading as the diastolic pressure. Record systolic and the diastolic readings. One of the biggest dangers about hypertension is that it can often go undetected until it is very serious. If you have any of these symptoms, even minor, please consult a doctor right away and start to get the help you need. On the other end of the scale, low blood pressure is when there is not enough pressure pushing the blood vessels through your body, and can result from a number of factors which make the heart weaker. Likewise, if you feel any of these symptoms, please consult a doctor straight away. Exercise regularly – Exercising, even moderate, for just 30 mins a day can really help bring your blood pressure down. You’ll have to be consistent, because once you stop your blood pressure can rise again. Exercising will also have the huge benefit of helping you lose some weight. As you know, blood pressure often increases with weight, so slimming down a bit will also be beneficial if you are overweight. 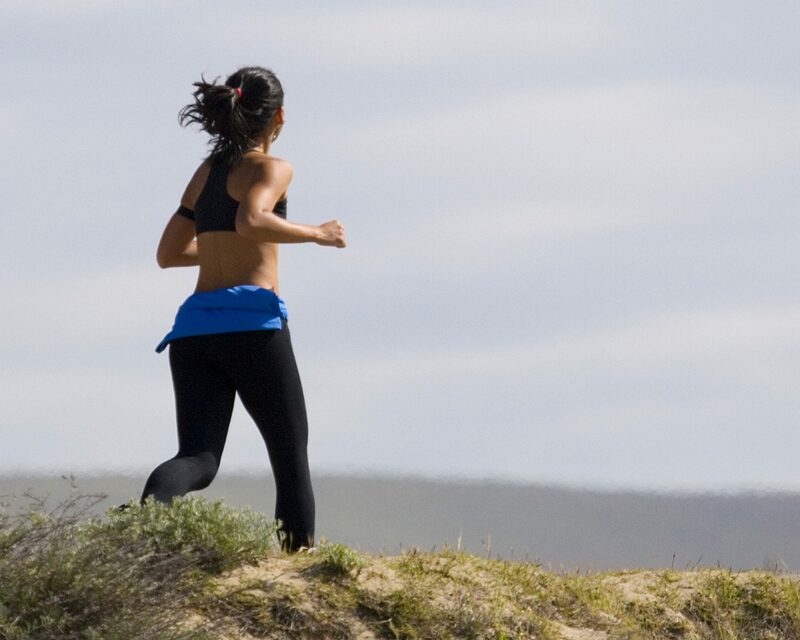 It could be as simple as taking a brisk walk, or perhaps swimming, jogging or cycling. Be sure to consult your doctor first though. Eat healthy – A balanced diet full of fresh fruit, vegetables and low-fat dairy can lower your blood pressure by up to 14 mm Hg. Consult with your physician or nutritionist and come up with a diet plan to help your condition. While its definitely a job for medical professionals to help you come up with your diet, yuou should consider foods high in potassium, such as bananas, as the potassium can lessen the effects of sodium on your blood pressure. Reduce sodium – did you know that cutting down on salt in your diet can reduce blood pressure by 2 to 8 mm Hg? While you don’t have to cut it out completely, check with your doctor as to how much sodium you should be allowed each day. Remember to read food labels, eat smart and don’t add salt to your meals. Drink alcohol moderately – High levels of alcohol consumption can contribute to high blood pressure, and if you have a condition, you are not doing yourself any favors by drinking a lot. Cut down on Smoking – Smoking causes high blood pressure and the clogging of arteries. Cutting down on cigarettes and vaping will help bring your blood pressure down as well as making you less at risk for lung cancer. Better still, cut out the smoking altogether. How Can Exercise Reduce Blood Pressure? If you have high blood pressure, its not just your diet and alcohol intake that you need to watch. 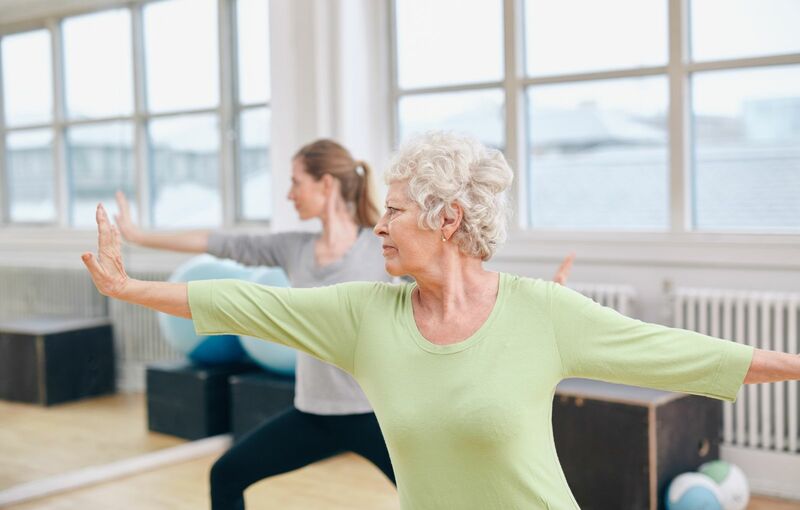 There are a lot of exercises that you can incorporate into your weekly routine that will help you reduce your blood pressure and improve your health in general. Regular physical activity makes your heart stronger, and a stronger heart will pump more blood but by using less effort and energy. If your heart is therefore working more effectively and pumping more blood, the strain and force on your arteries decreases, thereby lowering your blood pressure. Having a more active lifestyle can active can lower your systolic blood pressure by an average of 4 to 9 millimeters of mercury (mm Hg). That’s even more effective than some medications, so exercise can also reduce the amount of pills you need for your blood pressure Even if your blood pressure is normal, exercise can help prevent it from rising with the passing of time. It also helps you keep your weight under control, another way to keep your blood pressure at a healthy level. Regular exercise also helps you maintain a healthy weight — another important way to control blood pressure. However, you need consistence and regularity in order for this to have an effect. Therefore, don’t expect to see any results until you’ve been exercising regularly for a bout three months. After than, you should notice a decrease in blood pressure. What kinds of exercises are good for high blood pressure? You don’t need to magically transform into a gym bunny in order to get your blood pressure down. Moderate aerobic exercises will be a great place to start, and 30 mins of walking, jogging, swimming or cycling a few times a week can be a good way to kick off. Really, though, anything which breaks out a sweat will be good, so even household chores, gardening or such is effective. Why not try something you enjoy, or a new hobby? What about Salsa dancing? Tennis? Table Tennis? Hiking? go for something you like. Weight training can also be very effective for blood pressure. Now, we’re not suggesting that you turn yourself into the Hulk and start living off protein shakes, but some light weightlifting, calisthenics or body weight exercises can help a by giving you a cardio boost as well as helping you build a little bit of muscle. This new muscle will help raise your natural metabolism, so your body will burn more calories in its daily use in a nice and healthy way. If you are overweight as well, building some muscle will help you maintain good posture and also fill up the excess skin that serious weight loss can give you. First of all, you’d better check with your doctor to see if this will be safe for you, as weight lifting does temporarily increase your blood pressure. We also recommend getting started with a professional trainer who can show you the proper form and how to avoid injury. You don’t need to turn into the terminator, so we recommend a moderate, all over program that works out all parts of the body. Does Smoking Raise my Blood Pressure? When most people think about blood pressure problems, they mainly think about poor diets, stress, poor lifestyle choices, overworking and bad diets as the main causes. But did you know that, even if you lead a very healthy life, smoking can still give you high blood pressure? In fact, it can be one of the main causes, and lead to heart attacks and other blood pressure problems. The big problem here is the nicotine in tabacco. It raises your blood pressure and your heart rate as well as narrowing and hardening your arteries, which in turn makes your blood more likely to clot. It will also stress your heart and sets you up for a heart attack or stroke. Therefore, if you are serious about controlling your blood pressure, you need to control your smoking. As you know, a bad diet of fatty, processed and salty food can be a contributing factor towards high blood pressure. Therefore, on the opposite side, a good and balanced diet can help you bring your blood pressure down or prevent it from becoming an issue in the first place. But you don’t have to punish yourself with a blood pressure diet. Here are our top 10 foods for high blood pressure that prove you can still enjoy delicious and wholesome foods while bringing the pressure down. Potassium is natures biggest salt killer, and it helps your kidnesy get rid of salt by passing it into your urine. Taking out the salt will in turn lower your blood pressure.Why not try romaine lettuce, arugula, kale, turnip greens, collard greens, spinach, beet greens, or Swiss chard? Canned veggies often have a lot of salt, so don’t bother with them, but frozen vegetables contain as many nutrients and they’re easy to store, so they make a great alternative to fresh veg. You can also blend these veggies with bananas and nut milk for a healthy, sweet green juice. Berries, especially blueberries, are rich in natures very own flavonoids, nutrients which some food scientists believe may prevent hypertension and lower blood pressure. Blueberries, raspberries, and strawberries are easy things to add into your diet, and they can be easily stored in the fridge – just make sure to eat them before they go off. You can put them on your cereal or granola in the morning, and they make a great alternative to chocolate and cake if you want something sweet. They go great with some natural yogurt – just be sure not to pile on the sugar and maple syrup. Beets have high amounts of nitric oxide, which opens up your blood vessels and helps to lowers blood pressure. Some researchers also argue that the nitrates in beetroot juice lowered research participants’ blood pressure within just 24 hours. Beets can be great in many forms. They go well raw in salads, or you can juice them and make a great and healthy smoothy. You can get really creative and roast them, or fry them in a stir fry, or eve make them in the oven as chips or wedges. According to the American Heart Association, women who ate five or more servings of yogurt a week experienced a 20 percent reduction in their risk for developing high blood pressure. Just be sure to avoid the full fat stuff that us full of sugar and flavorings and you’ll be grand. Yogurt can go on cereal, granola or fruits and it will taste great. As all good Scotsmen and women know, oatmeal is the breakfast of champions, and its a high-fiber, low-fat, and low-sodium goodness does wonders to lower your blood pressure. You can have them as porridge, or sprinkle them on your cereal or granola. You can also make health deserts with oats, such as oat cookies and oat flap jacks. Best of all, oat cakes are a hearty and easy snack – throw some cucumber slices or salmon on them and you’re in heaven. Not just for monkeys, bananas are one of natures best high-potassium snacks, and as you know, not enough pottasium in your diet can cause you to have high blood pressure. There are endless healthy recipes that you can find which use bananas, and they make great snacks on their own. .
Finding healthy source of protein can be one of the problems with a high blood pressure diet, but some lean and healthy fish will do the trick. Mackerel and salmon have plenty of omega-3 fatty acids, which can lower blood pressure, reduce inflammation, and lower triglycerides. In addition, some fish have vitamin D, which can lower blood pressure. 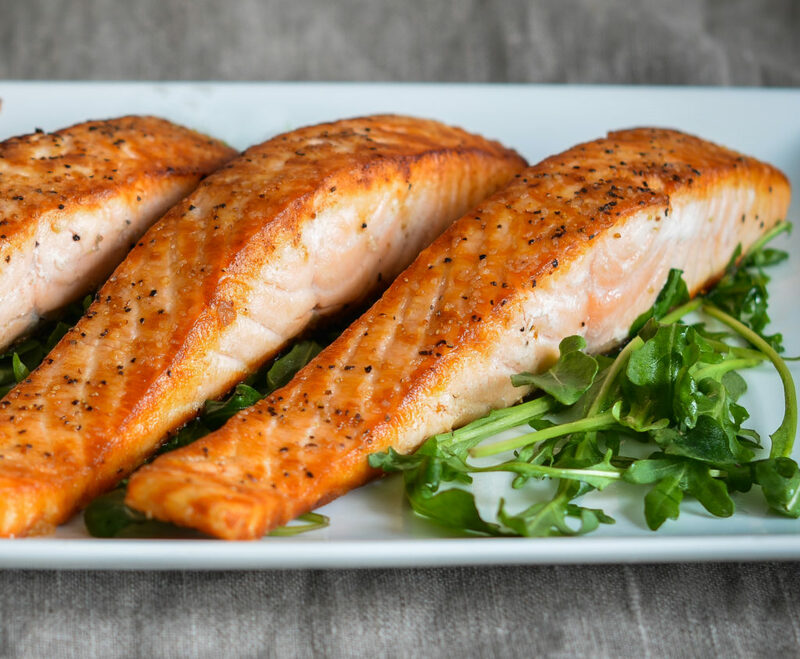 How about a nice fillet of salmon seasoned with herbs, lemon, and olive oil? Steam it, fry it, grill it…whatever you do, it’ll be gorgeous. Sunflower, pumpkin, or squash seeds are high in potassium, magnesium, and other minerals known to reduce blood pressure. They can be eaten with cereal, thrown in smoothies, or just had on their own as a wonderful snack. Enjoy ¼ cup of s as a snack between meals. 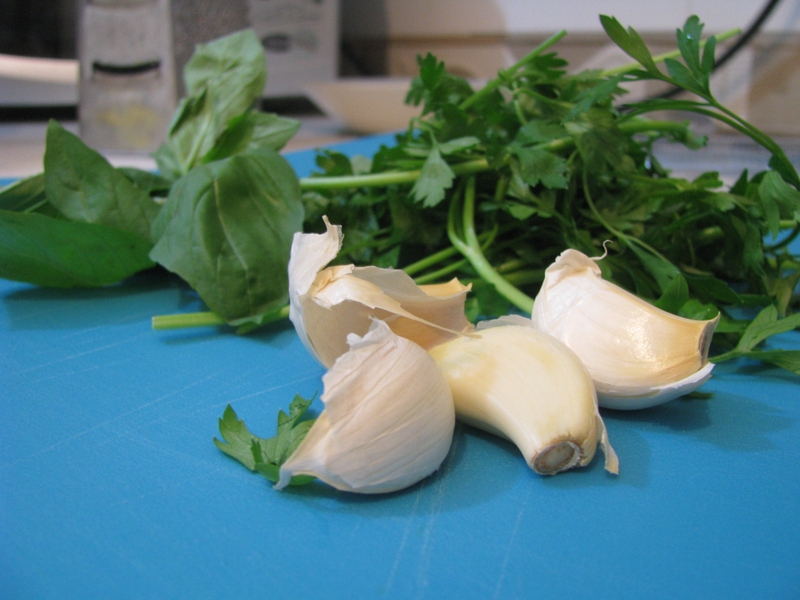 Garlic is not only a great seasoning that can spice up a bland dish, but it can also reduce hypertension by increasing the amount of nitric oxide in the body. Nitric oxide encourages the widening of the arteries, which will reduce blood pressure. As for other herbs, although they might not have a direct influence on the blood pressure, using them can give flavor to your food and cut down on the amount of salt you need to put in. Why not try using basil, cinnamon, thyme, rosemary, oregano and to give awesome flavors and smells to your dishes? Wait, chocolate? Did we hear that correctly? Well, yes, as a 2015 study found that eating dark chocolate is associated with a lower risk for cardiovascular disease. Also, Dark chocolate contains more than 60 percent cocoa solids and has less sugar than regular chocolate. So you can still get your does of chocolate, and you don’t have to feel guilty about it.